Everything for babies has changed so much since my kids were small. All of the handy dandy gadgets and the quality of baby accessories have drastically changed. I remember the diaper bags I carried for my little ones. They were basically a big bag, along the lines of a beach bag with silly prints on them. I just threw everything I needed for the baby in it and by the time I needed something out of the diaper bag it was a jumbled mess and it took forever to find what it was that I needed. 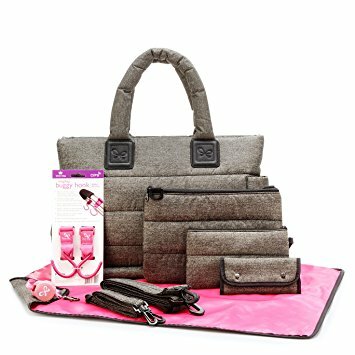 So when I was given the opportunity to try out the CiPU 9 Piece Diaper Bag I was really excited. We have our first great grandbaby due in just a few weeks and I just knew how excited my grand daughter would be to use it too. This diaper bag is very lightweight and the material it's made of is soft and almost silky to the touch. It's water resistant to keep all of the contents of the bag nice and dry. It has 13 wide compartments to keep all of yours and the baby's things organized. There are 9 interior , and 4 exterior pockets, plus 2 elasticized pockets in the interior that fit most bottles. If that's not enough there's a secret compartment in the bottom of the bag for dirty clothes or shoes to keep them separate from the clean stuff. This bag also comes with stroller handles so you can hook it to the handle of a stroller, shopping cart, etc. There's also a shoulder strap so you can have both hands free when carrying baby or whatever else you may be carrying. It's slip proof so it stays on your shoulder instead of sliding off like the old ones did. This is a very stylish attractive bag and I really like the grey color, it's gender neutral. The CiPU Diaper Bag has SGS Certifacation and EU RoHS Certification that insures it is nationally and internationally compliant with standard and regulations which means it is not made with any hazardous materials and it is of the highest quality.